Feast Week is one of the best parts of the season, as the sport gets some November time in the national spotlight before ceding it back to college football and the NFL. Teams are still rounding into form, so while quality of play isn’t the best, coaches and players alike get a chance to test themselves against quality competition in neutral-site settings. Before the ball is tipped in the weeklong extravaganza of hoops, though, the festivities begin with the College Basketball Hall Of Fame enshrining its Class of 2014 in Kansas City on Sunday night. A synopsis of each of the inductees is below. 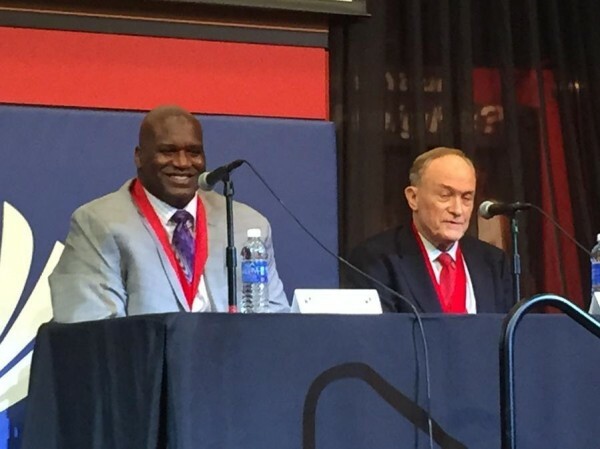 The Big Aristotle and his coach at LSU, Dale Brown, add another accolade to their illustrious careers. In a shocking turn of events, news was released late last night that Manhattan’s Steve Masiello, who had agreed in principle to become the South Florida head coach on Tuesday morning, was no longer a candidate for the position after a “discrepancy” was found during his background check. As of this writing, there had been no speculation as to what the deal-breaking issue might have been, but it certainly puts the parties of Manhattan, South Florida and Masiello in rather awkward positions at this time. Even though his sophomore season has yet to be completed, it appears Louisville forward Montrezl Harrell will forgo his junior and senior seasons and enter this summer’s NBA Draft. Harrell averages 14.0 points and 8.4 rebounds per game and is projected to be selected somewhere in the middle of the first round. The eventual loss of Harrell is not a surprise to Louisville fans, but it definitely makes the departure of Chane Behanan that much more difficult to swallow. Behanan would have been back for his senior season, filling a void in the frontcourt. Now Louisville will have to rely on Mangok Mathiang and unproven freshman and sophomores in 2014-15. One of Louisville’s all-time greats, Darrell Griffith, was selected to join the National Collegiate Basketball Hall of Fame as part of the 2014 class. Griffith, also known as Dr. Dunkenstein, led the Cardinals to their first national championship in 1980. The local Louisville Male product is responsible for a 101-25 record in four years with the Cards before becoming the second pick of the 1980 NBA Draft and playing professionally through 1991. Griffith joins UofL Hall of Famers Denny Crum and Wes Unseld in the shrine. When the ball is tipped on Friday night, Louisville fans can take solace in one historical statistic heavily in their favor: Rick Pitino is 11-0 in Sweet Sixteen games as a head coach at Louisville, Kentucky and Providence. That figure is impressive on its own, but throw in the margin of victory of 19.7 PPG and it’s simply unheard of. To make it 12 in a row he’ll have to take down rival Kentucky, something he’s had a hard time doing since taking over at Louisville. He’s won only five of 14 matchups with the Wildcats, and just one of six versus John Calipari. After being snubbed by the NCAA Tournament Selection Committee, SMU did not pout and whine. Instead, after Monday night’s impressive win over LSU, the Mustangs are one game away from making it to the NIT semifinals in Madison Square Garden. It was another sellout crowd and another win at Moody Coliseum. The SMU faithful, who have witnessed wins in every home game except one of 18 this season, will get one more look at their team tonight against California. Now with 25 wins, this version of the Mustangs ranks fourth in school history in victories and has collected the most since the 1987-88 team won 28. With quite a bit of star power returning and matriculating as freshman, it’s hard to argue against the notion that the Mustangs will be the favorites to win the AAC next season. Just when it looked as though we had some tenuous grasp of the complexion of this year’s Big East, these early-season tournaments rolled around and threw a healthy dose of chaos into the equation. UConn followed its marquee debut win against Michigan State with a loss to New Mexico in the Virgin Islands; Depaul soundly beat by Wichita State in Mexico; Georgetown shocked an oblivious viewing public with a superb performance in Brooklyn, falling short in overtime against the top-ranked team in the nation. Marquette, having had their hearts ripped out when Rotnei Clarke hit the biggest shot of the nascent season, rebounded last night with an emphatic 89-62 win over a reeling Mississippi State team. Marquette blog Paint Touches points out that Vander Blue has shown huge improvement in Maui in his two biggest areas of weakness––outside shooting and patience in the lane. He’s racked up 39 points and hit 5 of 8 three pointers against Butler and MSU. Marquette fans should feel relieved that Blue (11 PPG, 3 RPG) and Davante Gardner (14.7 PPG, 6.3 RPG), the two players widely regarded as wildcards headed into the season, have shined on their way to a 3-1 record. Joseph Santoliquito at CBS Philadelphia writes that Villanova’s freshman point guard Ryan Arcidiacono leads his team in scoring and assists less than a year after surgery to repair a herniated disk cost him his entire senior season. Arcidiacono credits a persistent optimism and healthy sense of detachment as responsible for his incredible recovery: “I never think about my back injury. To me, I never had back surgery. When people ask how my back is doing, I ask, ‘What back?’ The surgery never honestly took place. I had some doubts, but I found out I was strong enough to get through it and get back to where I was.” Jay Wright sees shades of a prolific former point guard in the freshman’s unwavering confidence: “Scottie Reynolds was the same way as a freshman…Reynolds has a record for nine turnovers in a game, but only because he wouldn’t stop after the second or third turnover. He just kept coming, and coming. I think Arch will be the same kind of kid. I think he’ll have some bad nights, but his bad nights will be from trying to do too much, and I like that.” Arcidiacono had the first such night of his young college career yesterday, shooting 3-11 (1-8 from long range) in Villanova’s embarrassing 75-57 home loss to Columbia. It’s no doubt better to gain the instructive perspective of a humbling loss early in the season, and utilize lessons learned once the games gain significance after the New Year. Lastly, Rick Bozich at the Courier-Journal yesterday published a story about a community-based boarding school in a depressed West Louisville neighborhood that will break ground this week a gym named in honor of Darrell Griffith, UofL’s most famous Doctor of Dunk. “No matter what athletic ability that you have, you’ve got to have an education,” said Griffith, who first dunked a basketball at the defunct Virginia Avenue Elementary School on whose former site the West End School now sits. “You’ve got to find your way in life. And it starts at this level.” Said fellow Cardinal alum Junior Bridgeman, who helped fund the $2 million structure: “If you’re going to hold up someone and say, ‘He’s from here. Look what he became in life and look what he accomplished in life. It’s not a matter of where you’re from.’ You couldn’t have a better person than Darrell Griffith. It’s great that we can honor him that way. He deserves it and the kids need to know about him.” It’s a profoundly encouraging account of former college athletes taking an active role in community stewardship, and a welcome reprieve from the shallow avarice of conference realignment that’s gripped Louisville this week. Few college basketball fans are born with their love for the game. For most aficionados, at some point on the way from infancy to college hoops fan, there is a moment. A single play, shot, player, game, or event at which point they say to themselves, “I will always have this in my life.” Because it is the time of the season that carries the most gravitas, these things often happen in March. We asked some of our friends and correspondents: what was the thing that turned you into a lifelong college basketball fan? What was your…March Moment? We’ll be posting some of their answers for the rest of the month. March has a funny way of changing things. The NCAA tournament kicks off, and 65 teams get a shot to extend their seasons and for three weeks David and Goliath find themselves in the same shoes…win or go home. It has a unique way of bringing out the best and even the worst in people, and sets a stage for Cinderella to flex her muscles. Simply put, March Madness is without a doubt the best three weeks in sports. Most people have their favorite March memory, whether it be “The Shot” by Christian Laettner (which somehow find its way into every CBS broadcast), watching Houston’s Phi Slamma Jamma square off against the Doctors of Dunk (Louisville and Darryl Griffith), or any moment in between. As a Kentucky fan, I feel I have my own unique perspective of The Big Dance. Although the Cats have won two titles in my lifetime, the moment that stands out the most came in a loss. In 2005, Kentucky was on a roll. After sweeping through the regular season with a 23-4 record, the Cats were poised to make some waves in the tournament. After a couple of close wins in the opening three rounds, the only thing standing in the way of UK and a Final Four berth was a pesky overachiever from East Lansing…Michigan State. After playing the Spartans close for the entire game, Kentucky found itself down three points with just 19 seconds left in regulation. That’s when something spectacular happened. After a couple of misfires from behind the arc, Patrick Sparks chased down a long rebound with just two seconds left and let loose a prayer that would decide if the season would be extended. The prayer was answered. Overtime. Although the Cats would fall just two periods later, that shot would change my life. That’s the moment that I realized how much Kentucky basketball meant to me. I had been a UK fan since before I can remember but in the seconds surrounding that play it took on such a new meaning. As Sparks’ three-pointer bounced around the rim, time stood still. Although just an instant, it felt like it lasted forever and my heart didn’t resume beating until after the ball had found its way safely through the net. The emotions that exploded after that one shot changed the way I looked at the game. Basketball wasn’t just a sport anymore; it couldn’t be. It was something so much bigger. While jumping around the living room with my dad and little brother, hugging and high fiving, I realized how important it was. The way it felt to share that with them is something I’ll carry with me for the rest of my life. As I get older I’ll always look back on that day and smile. That day, that moment, is when everything changed. Isn’t it funny how March can do that to you?